It is the Democracy day in Nigeria.In the light of the recent occurrences, I do not see it as a day to roll-out the drums and celebrate. While it's good to stay positive and grateful,I believe it's a perfect time to realize the objective of rescuing the Chibok girls. These were the girls kidnapped by some terrorist sect weeks ago. 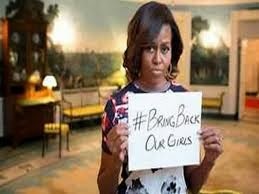 The #BringBackourgirls campaign is no more news. I am personally supporting the campaign on my twitter handle - @emmandus.